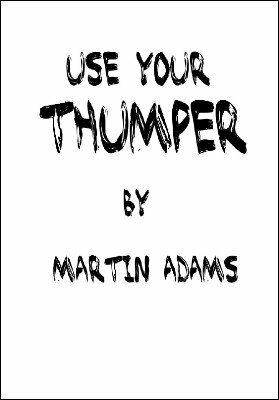 In this manuscript you will find a solution how you can achieve effects that use a thumper without a thumper. You don’t have to buy expensive mentalism devices to make it possible. There are two handlings and four effects in this manuscript. Thought of card routine, Which Hand and Kurutsuke type of effects are all possible and included in the PDF. You don’t need to buy anything because you probably already own the gimmick. This ebook will give you the power that a hundreds of dollars device can give you. The performer asks the spectator to think of any playing card from a regular deck and to show the card to everybody. Before the spectator shows his card the performer leaves the room. After the selection process is finished the performer is able to reveal the freely thought of card. Five objects are placed on the table. Five spectators remove one object each. While the performer is in another room. Only one is holding the "secret" object that the performer is looking for. Now you start to eliminate each of the objects one by one until you are left with the person holding the "secret" object! You are able to find the hidden object without any chance of failure. 1st edition 2010; 14 pages.